If Seahawks cornerback Richard Sherman played baseball, Tigers ace Justin Verlander would send him a high-and-tight message. Justin Verlander knows exactly what he would do if Richard Sherman talked trash about him. "If he played baseball (he) would get a high and tight fastball," Verlander, the Detroit Tigers’ hard-throwing right-hander, tweeted after watching Sherman’s rant Sunday on FOX’s telecast of the NFC championship game. Sherman, a cornerback for the Seattle Seahawks, has been heavily criticized for his crazed reaction during a post-game interview immediately after a victory over the San Francisco 49ers to clinch a berth in the Super Bowl. Sherman, who had made the key play in the final minute, bragged that he is the NFL’s best cornerback and went so far as to call San Francisco’s Michael Crabtree "a sorry receiver." In baseball, the benches would be clearing the next time the teams met. Meanwhile, Max Scherzer, another ace pitcher for the Tigers, has been watching these NFL playoffs closely, too. "Instead of shaking off Alex (Avila) next year I’m just going to stand on the mound and yell #Omaha," Scherzer joked in a tweet. Scherzer was referring to Denver quarterback Peyton Manning’s constant use of the word when he’s calling signals at the line of scrimmage. Who knows? 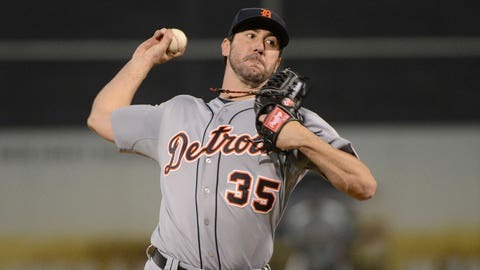 Maybe "Omaha" will be the new brushback pitch when Verlander wants to send a message to a trash-talker.